Happy New Year! Please allow me to take this moment to thank you, our readers. We’ve enjoyed your comments and look forward to our exchange in 2015! In today’s post, we will be discussing 3D Printers. Last year flew by in a flash, while this year commemorates Adept’s 20th anniversary. It seem like just yesterday when we opened our doors to new and exciting projects. A lot has certainly changed in the past 30 years, notably, advances in computer technology coupled with its’ user friendliness has been nothing short of remarkable. Technology once reserved for the elite has quickly becoming mainstream. In 1985, most engineers were surfing the net through 14.4 modems, Creo was known as Pro Engineer and Solidworks was,… nonexistent. So many technologies have advanced, but one technology that has truly coming-of-age is Additive Manufacturing. It may also be familiar to you by its process name, Stereolithography or SLA. Although, Additive Manufacturing is accomplished through a vast number of processes today, not only SLA. Some of the processes are so dialed in they’re capable to fabricating jet engine assemblies. In the late eighties, when 3D design was reserved for primarily defense contractors and multimillion dollar corporations, I was fortunate to be a one of the few at Sikorksy Aircraft. I can remember one afternoon while we were humming along on Caids, Cadra, Catia and Pro E, when a young company called “3D systems” performed a presentation about a new technology called Stereolithography (SLA). We were told that within hours we could hold in our hands a physical prototype of our 3D computer models. How cool was that?! We were then asked to envision a time in the not so distant future, when we’d be able to fabricate working production ready components by a similar process. In addition, we were also reminded that soon there will be no more drafting boards in our engineering department . Many of use recalled laughing at that too, and there extinction was already well underway, so the snickers were short lived. Once the presentation ended, we went back to work thinking what if? As I further reviewed this technology, I couldn’t help notice that this vision although incredible was lacking a bit on execution. The material was fragile and the UV light made it brittle and unstable. I began to think that the technology had potential, but there were few real world applications. Additionally, we were still very distracted by the mere ability to conceptualize, design and visualize our ideas in 3D while creating views and cross sections in a blink of an eye. The things we take for granted today!? A short time later, I was conceptualizing a composite transmission housing and it became obvious that management was having a difficult time visualizing what I was proposing. The 3D computer images were great but limited, particularly when the conference rooms were outfitted with viewgraph machines, white boards and mobile data storage was restricted to a 1.44 Mb disk! I soon realized this was an ideal opportunity to utilize SLA. With the presence of an actual physical model, management was delighted. T So ecstatic they requested 6 more to use for discussions with other stakeholders. This gave us the opportunity to try out silicon molding too. We ended up making a dozen or more polyurethane copies from a silicon mold of an SLA and they were a hit. Thirty years later, we still use SLA and other similar technologies to prove concepts and demonstrate ideas. In the past, the utilizes and supplies needed to support SLA were costly and even toxic. Today, these capabilities are at our fingertips and can reside on our desktop, just like your simple ink jet printer. The 3D printers of today are certainly more user-friendly than the SLA machines of the past. Although, they’re a far cry from the “replicator” they can be pretend to be. Machines like the Cubify or Makerbot are certainly approaching the price point of an expensive television and it seems like anyone who can program a gantry is marketing a 3D printer, so buyer beware. 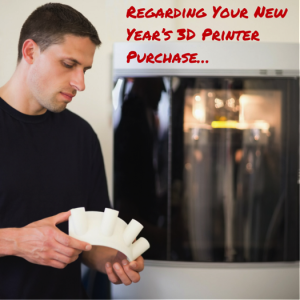 Buying a 3D printer is just like buying an inkjet printer, or is it? Working with this technology for the past 30 years, I’ve got a good handle on its’ assets and limitations, or at least I thought…more about that later. With the latest 3D printer craze, I found myself becoming kind of a pessimist. Similar to the availability and simplicity of ink jet printing technology, it seems like everyone with a garage and time to spare is selling 3D printers. Salesmen convincing designers and inventors that they will be obsolete if they don’t join in the 3D maker movement. Like most sales pitches, I prefer to look behind the curtain. Many 3D printers I’ve seen sit idle or produce pre-modeled downloads of trinkets that end up in the bottom of someone’s desk drawer. Don’t misunderstand me, there are many seasoned designers and engineers with 3D printers and putting them to excellent use. However, the hard long hours that should be spent on engineering, analyzing and designing are sometimes replaced by producing poorly thought out prototypes while hoping it works. Good luck with that approach! Perhaps if you’re James Dyson and have 15 years of patience to make 5127 prototypes, you can come up with a really cool vacuum. However, if James came out of his barn for a couple of days and did some research, he may have found that Sikorsky perfected a similar method for removing dust from air. Luckily, Sikorsky had no interest in vacuums, and the patent ran out by 1993. James also believes failure leads to success, but 5126 times? Come on Jim! I happen to believe sound engineering leads to success. Failure will happen, but success only comes by dissecting and understanding your failure and applying known engineering principles again, to reach the end game. And with that, the number of prototypes should remain in the single digits. The Auto industry is a prime example of this. Additive manufacturing would’ve cut Jim’s barn time quite a bit. And, I am sure the Dyson Company is now outfitted with an entire division of additive manufacturing capability. Perhaps some FEA and CFD as well. However, with all its promise, additive manufacturing has its limitations and it’s important to understand each of the processes capabilities and limitations if you are truly to get what you need out of your prototype. With any manufacturing process, you must understand what it can do and what it can’t. As fun as it is to see your creation in real-time, the main purpose of making a prototype is to reduce risk. The risk resides in whether the virtual concept will accomplish it’s physical goals. Years ago, we were limited to fragile resins. Today, there is a range of materials and processes to choose from that are approaching real world properties. Even though, close attention must be paid to other component characteristics that will affect prototype performance, characteristics such as tolerances, surface finish, and manufacturability. Fortunately, the availability of rapid machining has given us additional capabilities to machine components in the intended material, thus further enhancing our ability to prototype. While it’s pretty cool when someone makes a working wrench or even a gun with a desktop 3D printer, don’t think that it happened overnight. The 3D models to accomplish such feats take a good deal of work to dial in. There’s one company that is really raising the bar. If you have not heard, GE’s latest jet engine, known as the LEAP engine is using additive manufactured parts in production. Specifically, the fuel nozzle. Previously, the fuel nozzle required an assembly of 17 parts. With Additive Manufacturing the fuel nozzle is manufactured as a complete assembly! The rules of design are changing in a big way. “Look mom, no fasteners!” Even the lead Engineer of this project was not on board at its onset, but accepted the challenge like and good engineer would.. GE has spent the last 11 years advancing this technology in order to give the company the ability to accomplish such an amazing feat! Of course there are still issues, like the time of manufacture. It takes several weeks to grow 1 nozzle and expect there are multiple post processes too. But companies like GE are hot on the trail to improve this technology and reduce production times. Regardless, GE is committed to install 17 fuel nozzles in every LEAP engine it sells. With a 6,000 engine backlog at $78 billion, you can expect that GE incentive to realize the many benefits of this technology. Now, if you think you’re anywhere close to something like this with your Maker-bot, think again But get ready to see much more from Additive Manufacturing. Did I say that it is a great time to be an Engineer! Thanks for reading. It is true that this technology is getting more and more reliable. Nice article Matt. We seem to share the same sense of skepticism. George and I have been ordering some rapidly prototyped parts recently, so we are familiar with the advantages and limitations. Thanks Doug. Say hi to George for me. Thank you Scott. We actually SLA’d a working model of the hydrant locking mechanism, dying each of the individual components different colors really helped the board see and understand the inner workings of that mechanism. As Engineers we stare at prints and 3D models all day long and know exactly what we’re looking at. For the non-engineer even the 3D models aren’t enough. I remember many years ago showing an assembly drawing to management and realizing they weren’t getting it and they admitted not knowing was space and what was metal!? I then colored all the individual parts with colored pencils, they loved it…this was before 3D and the like. But the same rules apply. Don’t assume others can see what you can, even if they say the can or nod as if they do. I’m sure you’re quite aware of this too.